After 42 days on snow and dozens of ski articles, I can't believe this is my last blog of the season! I renewed blogging after last summer break at the end of October and I have faithfully posted every week since then, cataloging my adventures around spectacular ski hills in North America. What an amazing season: fluctuations in snowpack and weird weather to make hearts sink but precipitation and powder days to make them (and you) float again! I skied in nine Canadian resorts, five Utah resorts and two Colorado resorts and managed to get turns in every month of the season – despite living down south. Just goes to show, where there’s a will there’s a way. Good news: I have two assignments already for early season with The Dallas Morning News, another with ABC parenting magazine in the South of England, and a new book contract with Goodfellow UK. 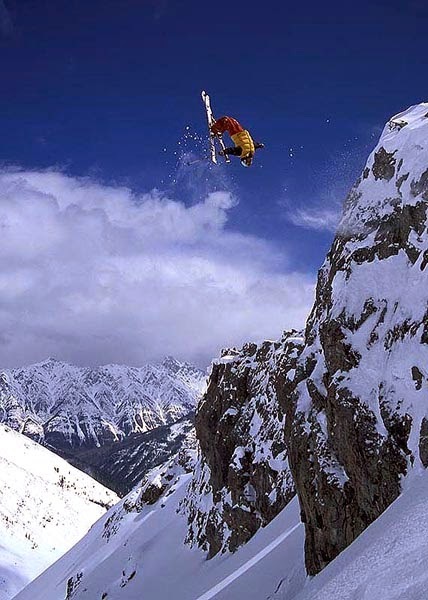 This is a huge project focusing on Winter Sport Tourism through the eyes of the people who work in the ski industry – should be worth some entertaining anecdotes as well as informative perspectives, experiences, statistics and marketing tips. Please let me know (on louise.hudson2011@gmail.com) if you, or someone you know, has a great job at any level within the ski industry or in a ski town, which should be highlighted in this book. Along with all the articles I hope to get accepted in Canadian and US newspapers and magazines, this book will keep me busy ski researching and writing right up to Sept next year and will be published in Nov 2015 – just in time for you all to buy the book for all your ski mad, ski industry friends, colleagues and family! Thanks so much for taking the time to read my blog this winter and also for any correspondence I have had with you. I love feedback! Look out for my first blog next season around the end of October. Remember to buy your season's passes at earlybird prices next month and also check out the sales for ski and snowboard bargains off-season. Have a great summer! I'm blogging from Denver right now, having just had five stupendous spring skiing days at Breckenridge and Copper Mountain. I'm in Colorado researching for ski stories for The Dallas Morning News and culinary travel tales for Eat Drink Travel magazine. The Mile High City looks interesting, but right now I'm still high on my spring skiing experiences! Staying at One Ski Hill Place in Breckenridge gave me a taste of cushy Colorado condo ownership, right on the ritzy hill. This is the ultimate ski in/out decadence with designer apartments, topnotch interior design, a zen-like spa area with a gorgeous indoor pool as well as outdoor hot tubs and all the steam room and massage facilities you would expect from a top resort. They like to surprise you there with extra touches such as free Starbucks or iced water at various junctures around the resort and eager-to-please ski valets who persuade you not to carry your own skis the few yards from the locker room to the snow. With a wide range of eateries and coffee bars, One Ski Hill Place borders the chairlift at the base of Peak 8 with views over the immense terrain parks. There are free shuttles as well as shuttle-on-command service to help you explore downtown Breck and the other satellite residential areas. 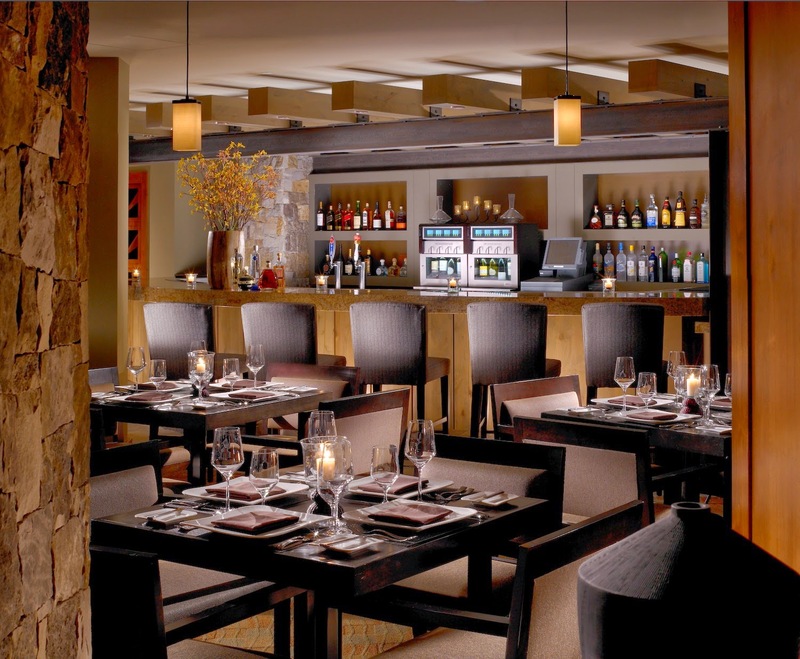 Sevens at Peak 7 is close, a great place for lunch, apres ski or dinner. And downtown is really worth a visit with its beautiful buildings dating back to the 19th century gold rush. 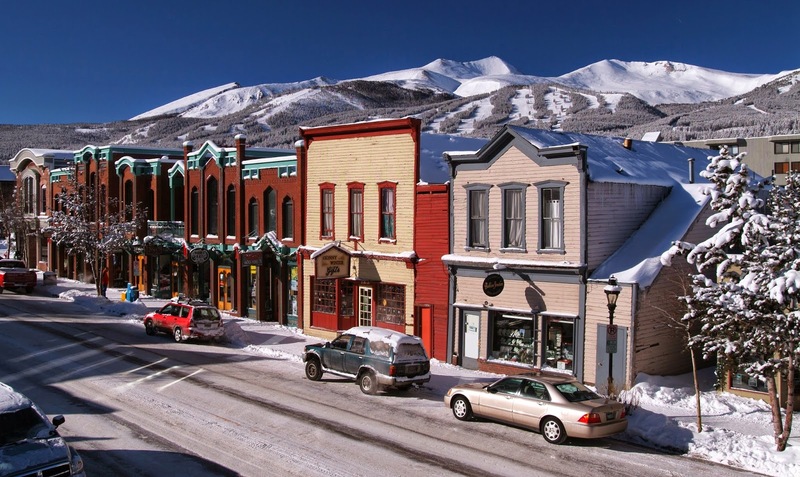 Although retaining their historic facades, these boom town buildings are now repurposed as upscale shops, trendy boutiques, restaurants, apres ski bars and services. They have been carefully restored and painted in pretty pastels or bright-coloured hues, making window shopping a kaleidoscope experience. And, of course, now there are several marijuana shops dotted around town to enhance the novelty of the picture postcard town. Although dining can be very upscale - and pricey - in Breck, happy hours offer great deals such as free nachos and salsa at Mi Casa and $10 mussels at Modis. With an incredibly high altitude of 12,998 feet (3,963 metres), the skiing at Breck is vast and varied with 34 lifts serving its 2,908 acres. The towering peaks of the "Fourteeners" (surrounding mountains all over 14,000 feet high) ensure that Breckenridge has fabulous snow all season. 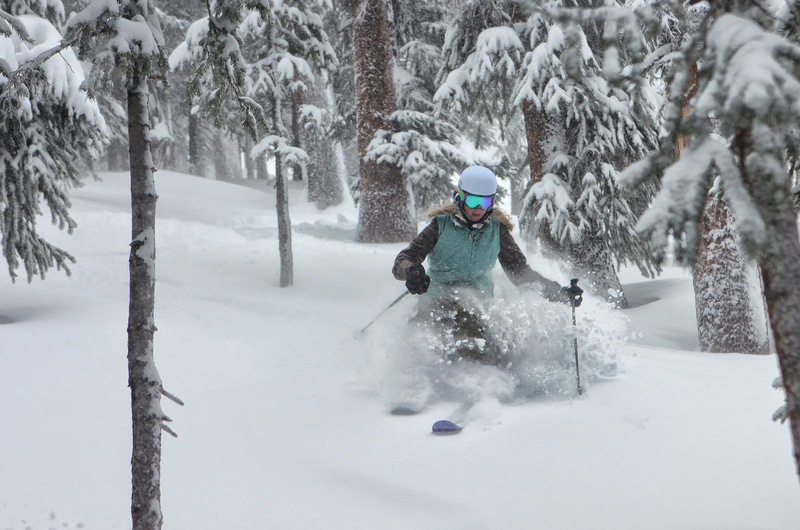 And because of the huge accumulation this winter - 435 inches so far - Breck is extending its season until April 27. Over the next two weekends, the Spring Fever concert series combines skiing all day with live music and dancing in the late afternoon sunshine. My favorite area to ski was The Burn off the Falcon chair where you can dip into exhilarating tree runs, find powder stashes long after snowfalls, and end up at the Ten Mile Station patio where you can relax on Adirondacks, watching the world whizz by. It's also great fun exploring the intermediate bowls and steeper hike-to areas at Peak 6 - with 550 new skiable acres, it is the biggest American ski hill expansion for a decade. 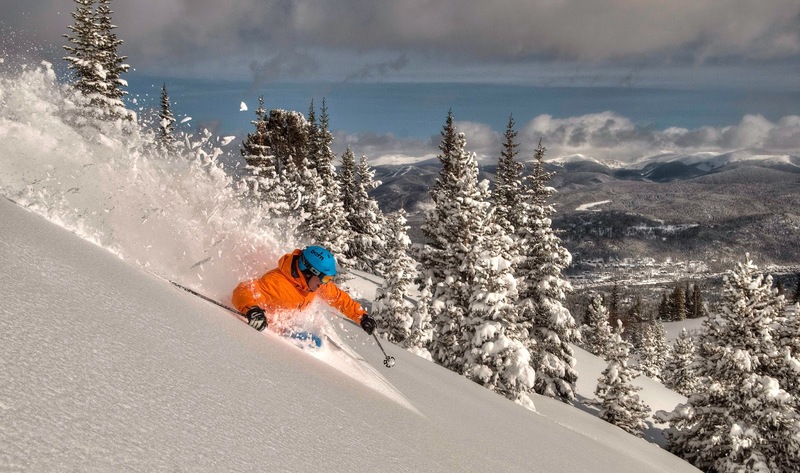 Whereas Breckenridge is well-known as part of Vail Resorts' portly portfolio, neighbouring Copper Mountain has a somewhat lower profile internationally. 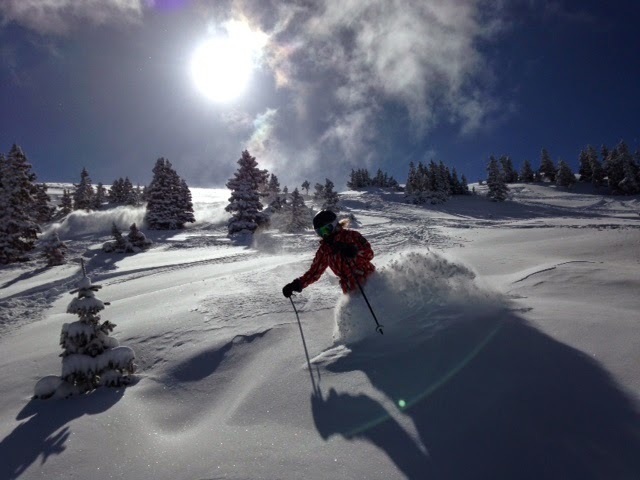 For those of you who have never skied there, I'm sharing a Colorado secret with you! 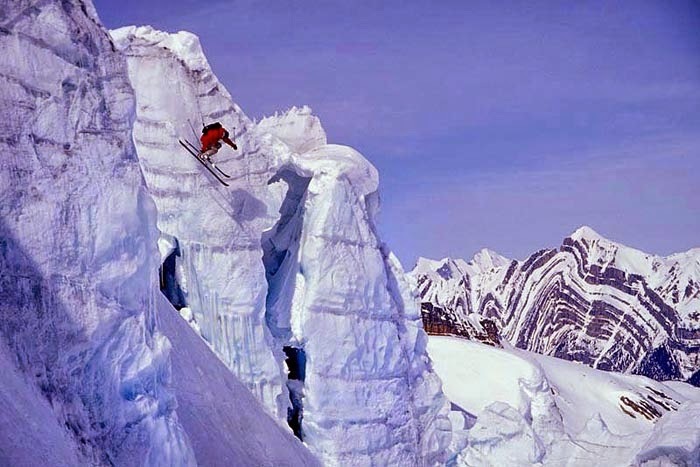 I found out about it a few years back when Pete Seel, a professor at Colorado State University, told me that he chooses to ski there. "It's definitely the more affordable place to ski in Colorado, especially when you have the family in tow," he says. 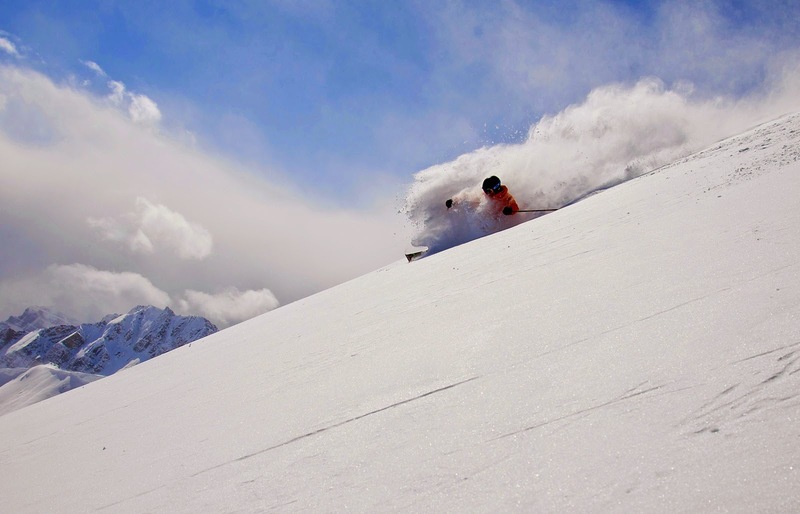 "It's our favorite area in Summit County and the good news is that the huge snow pack led Copper to plan to stay open for an extra week, so we'll get to ski there more this season." This was my first visit and I stayed at Tucker Mountain Lodge, a virtually ski-in/out complex of rustically-furnished condos in the Center Village. Bordering on the main chair lifts, the village - much bigger than I expected - is intersected by a river and centered around a lake, surrounded by pathways and bridges and traversed by a zipline. The paved streets have underground heating and they are dotted with shops as well as apres ski bars and restaurants with heated patios - and, better still, very affordable happy hours. There are events all season long, including Sunsation which was on when I arrived - complete with pool party, Teenie Weenie Bikini contest and live bands. There are five different terrain parks/pipes plus an extensive tubing hill with four lanes, banked turns and jumps, zipline, ice-skating and the impressive Woodward Barn with its state-of-the-art indoor training facilities. Copper's 23 lifts access really long, cruisy runs at lower mountain and challenging bowls, chutes and glades above - with less crowds than some of the big name resorts. In fact, in springtime it is just locals and workers who track out the snow. With 2,465 acres and a summit height of 12,313 feet, Copper Mountain was much bigger and higher than I expected. Resorts these days don't offer much in the way of free activities beyond the usual guided mountain tours. But Copper has a free snowcat service into in-bounds backcountry-style terrain in Tucker Bowl. 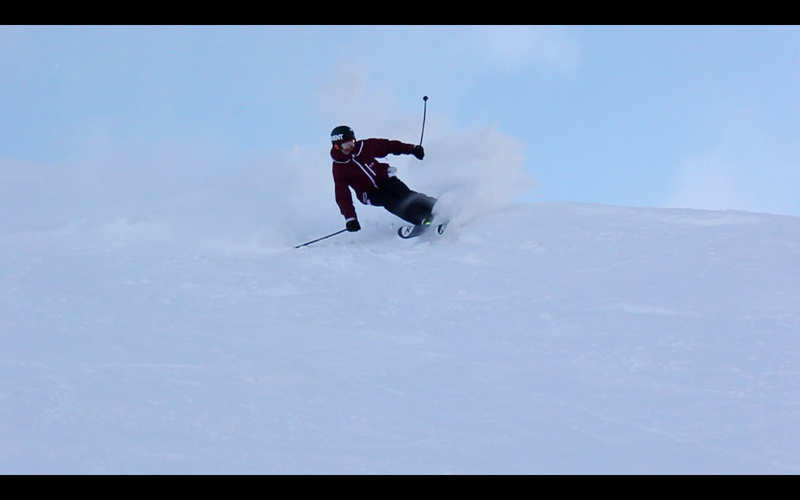 What a great opportunity to try out catskiing without the usual price tag! Disappointingly, it was closed when I was there. But it turned out it didn't matter: it snowed all day and night as I arrived and my first ski day was the ultimate powder day with surprisingly wintry temps keeping the pow cool and light all day long. Even the day-old powder next day was relatively light due to overnight cold. Turns out my snow-dar was spot on, too, as I managed to head straight to the locals' caches for first tracks in the Enchanted Forest and also Union Meadows the first morning. These areas stayed soft and light for two days and on day three I woke up to pow-duroy: my word for a light layer of powder atop groomed corduroy snow. What a fabulous way to end the season! I'll send you links to my Breck and Copper articles for The Dallas Morning News in early fall. By the way, I have now skied 42 days this season, which I think might be a record for someone living in South Carolina! 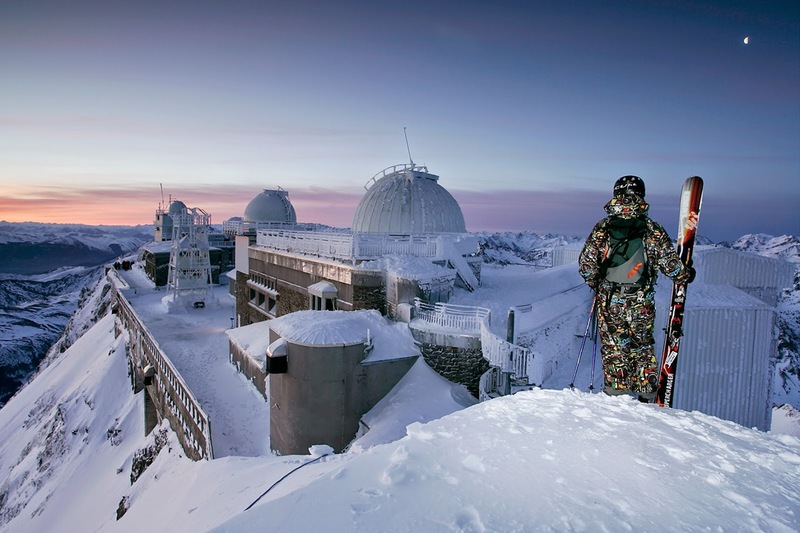 "Ski Photographer" must be high on the scale of the plumiest jobs on earth. World renowned ski and snowboard photo-journalists like Canadian, Dan Hudson not only get paid well for doing what they love, but they also get a kind of vocation vacation whenever they work, scouring the backcountry powder for poignant pictures. With an art degree from Ontario’s York University, Hudson fell into photography by chance after moving to Banff for an artist residency program. A San Diego surfing background led him to cross over quite naturally to snowboarding at Lake Louise and Sunshine. 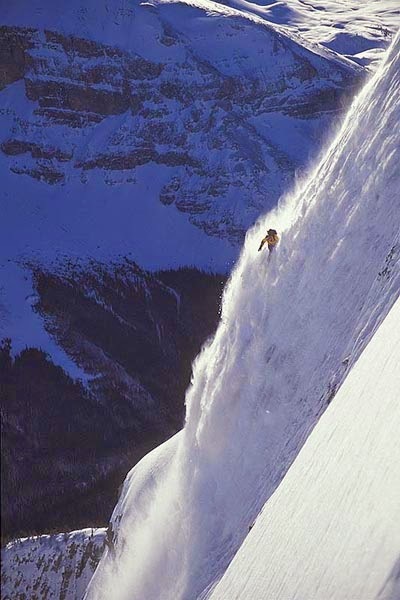 “Once I started snowboarding, the next natural evolution of that for me was going into the backcountry,” says Hudson from his hometown of Canmore, Alberta. “Taking photos is not a random kind of thing. People tend to think you go up the hill with a camera and take pictures of people passing by. To get a top quality photo of a pro athlete, doing the kinds of things people want to see in magazines, is not random,” Hudson warns wannabees. There is much consultation, too, with ski patrol regarding avalanche updates. “The key thing is we spend quite a bit of time talking to people and checking the internet for avalanche conditions. There has to be a certain stability before we even go,” said Hudson, whose crew always has basic or even advanced avalanche training. “If I’m going backcountry out of Sunshine, I go and talk to the snow safety guys there first. They know more about what’s going on than all the websites, all the specifics.” Snow Safety at any ski resort, he says, will always have additional and often important knowledge about the snowpack in the vicinity of the resort. "Their advice is invaluable and it is also an added layer of safety if they know where we are going." With pre-shoot prep complete, and safety equipment packed, the day starts out early. “If you wait until the lifts open, by the time you set up the shot, maybe 10 people have already gone through the powder. But I don’t often take pictures on the ski hill: you have to go just off if you want powder shots,” says Hudson. 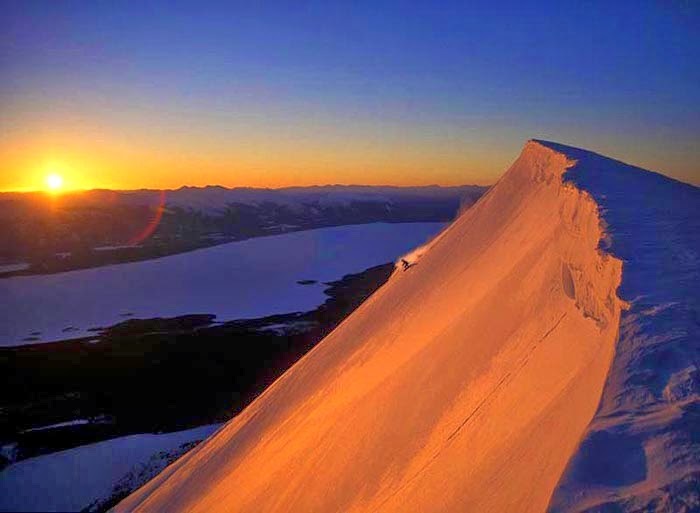 Backcountry trips start before daybreak in order to reach the assigned area in optimum light. Early March to early May yields the most propitious weather, snow conditions, stability and light. 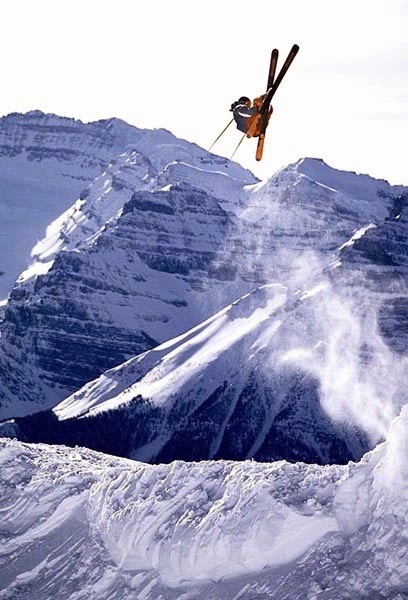 The shoot is a collaborative effort where Hudson works closely with his subject: the pro skier. “Say the pro says ‘I want to go off this cliff’, I then have to find the place to shoot, below or to the side, coordinate with radios and also throw a lot of snowballs to indicate the trajectory or the turn,” he explains. He must then line up the shot to include scenic landscape elements, mountains, and the steepness of the slope. “Then I let them come through my shot as opposed to me following them with the camera,” he says. Most of a typical day is spent trying out different stunts, various angles and diverse terrain and the crew rarely gets back before dark. But it’s all action, with little waiting around unless it’s for elusive sunny windows on a cloudy day. “For me it needs to be a fun day out for everyone,” says Hudson. 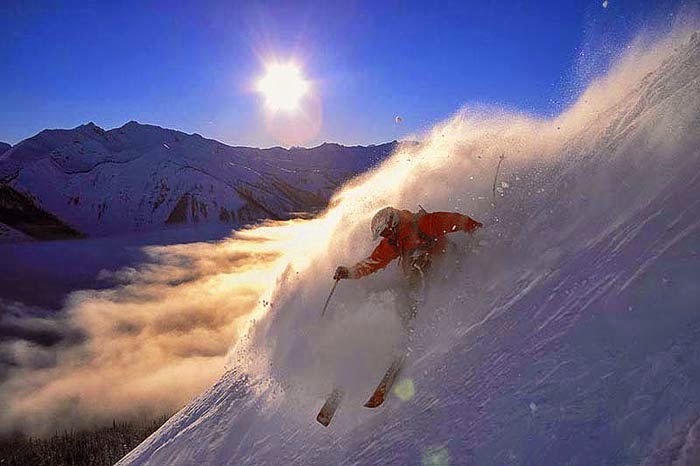 “I really enjoy taking photos but also really enjoy the skiing. We’re doing a lot of cool stuff out there. It’s not quite the same amount of vertical as if we were not working, but we’re still getting really good quality skiing or snowboarding.” Although he also skis, Hudson prefers snowboards as the real powder tool, for playing with the terrain. After the shoot, it’s time to edit the photography and present the best portion of it to editors. Because of his art background, Hudson is a stickler for standards in photography: “Some of the skiers, I drive mad because I’ll only release what I think is good. I edit pretty tight.” He reduces his shots to a selection of around 20 from which editors will pick maybe 10 of the best. Use Canon - it’s the leader in sports photography. Although lenses are expensive, you can replace the body as new technology comes out. Right now I really like the Canon 7D: I like minimal gear. - My style is on-slope photography, not across the valley. You need to shoot across the slope to get a sense of the steepness or gradient. - Never shoot up the slope. - Shoot the person in the sun and in colourful clothes such as red or yellow. 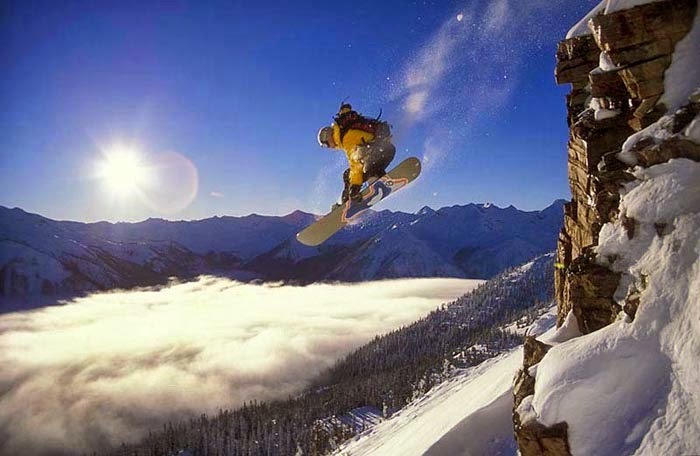 - Go out with a crew of two skiers or snowboarders – any more can lead to waiting. - Cross lighting is really important on snow to show the landscape. If you have the sun right behind you, it is like using a flash, it flattens everything out. If the sun is behind and to one side of the photographer, then you get shadows and definition. - It is best to take little sections of landscape - if you try to capture everything you end up with nothing. - If using a ‘point and shoot’, set shutter speed priority to 1,000th of a second and pre-focus. - Repetition is the best way to get good pictures. With changes in technology, the rise of the internet and the recession wreaking havoc on the magazine world, Hudson says his photography career peaked around 2007. “Now is probably not a good time to become a photographer – everyone has a camera, it doesn’t cost anything to print photos anymore. Cameras themselves are cheaper, you just buy a memory card and there are no more costs. 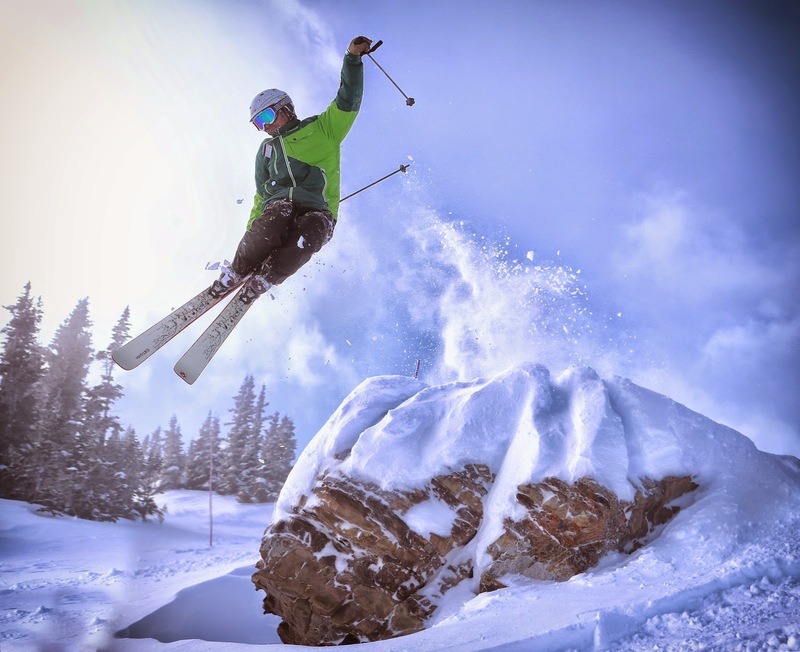 Video is cheaper, too, and good quality on regular cameras.” This has led to a plethora of video and photo contests, established by resorts and ski companies, to get free photographic marketing for their products. Even a snowboarding sensation like Hudson has to know when to hang up his split board and telephoto zoom lens. “Doing this kind of photography working with top pro athletes, they seem to stay around the same age of 19-25 but I keep getting older and it’s becoming harder to keep up with them,” he laments. Now semi-retired, Hudson has reverted to the life of a full-time artist while keeping his hand in shooting and snowboarding at Sunshine and on catskiing trips. Spring Skiing is an oxymoron to many people who associate April with the beginning of summer rather than the end of the winter. You can't blame them: it's a natural hankering for sunshine and fresh air after a long, tough winter. This month, newspapers and magazines everywhere switch from ski stories to summer travel, hiking, biking, horse-riding, watersports and camping. Retailers fill their stores with summer clothing, garden furniture and beach accessories well in advance of actual need. However, while all this wishful thinking is going on, savvy skiers are getting in some of the best turns of the season, squeezing full value out of their season pass, taking advantage of special spring pricing or taking a late season ski vacation and getting much needed Vitamin D.
Some ski resorts close down in early April, but many are open until the end of the month and, a select few, like Sunshine Village in Alberta and Whistler Blackcomb in BC, well into May. If you're lucky you might get an overnight snowfall followed by baby blue skies with powder all morning until warm temps make it soupy. Alternatively, the resort may have had a balmy afternoon the previous day followed by an overnight freeze. In this case, your best bet is to ski corduroy on the groomers first thing while temps are still crisp. When the corduroy is shredded, stop mid-morning for coffee or brunch plus scenery-soaking on a panoramic patio such as Lake Louise's new Whitehorn Lodge patio and ice bar. Then, when the lunch bunch starts swarming, get back on the uncrowded slopes just as the midday sun is melting the refrozen snow. Ski the now-softened bumps, glades and other ungroomed areas all the way through until 3 or 4pm when it is time for al fresco apres ski. 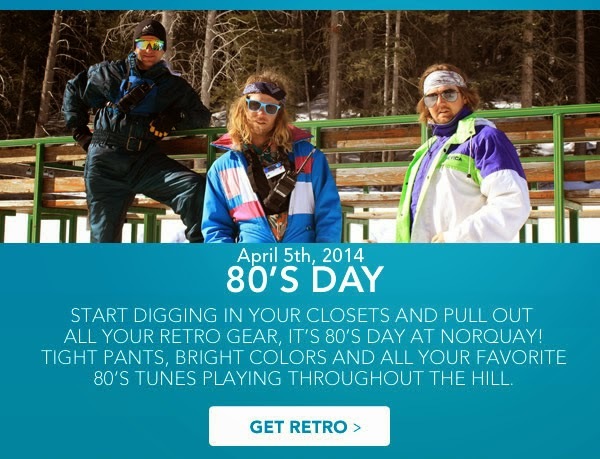 Banff Mt Norquay - 80s Day is coming up this weekend. Other events include the Bozo Cup with a guest appearance by Olympian Jan Hudec who won Bronze in the Sochi Super G.
Nakiska's Spring Olympics return again this April with DJ's pumping tunes in the base area and non stop family fun including obstacle course races, the Easter egg hunt and a visit from the Easter Bunny. 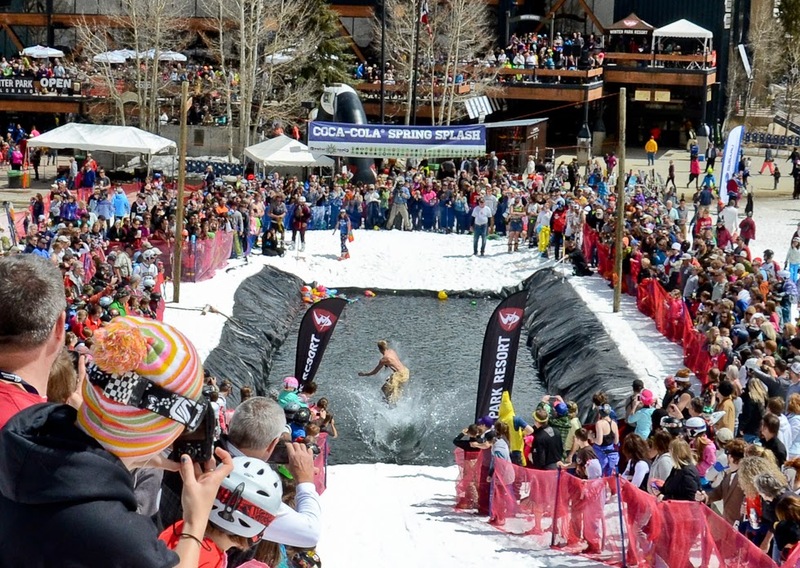 Sunshine's DJ music tent and spring beer garden opens this weekend, launching a long series of outdoor musical, culinary, and ski/board events which culminates with the Annual Slush Cup May 19. Lake Louise is hosting a KROWD night club event Sat with 1000 partygoers dancing in the daylodge all night. All KROWD participants get reduced lift tickets over the weekend. 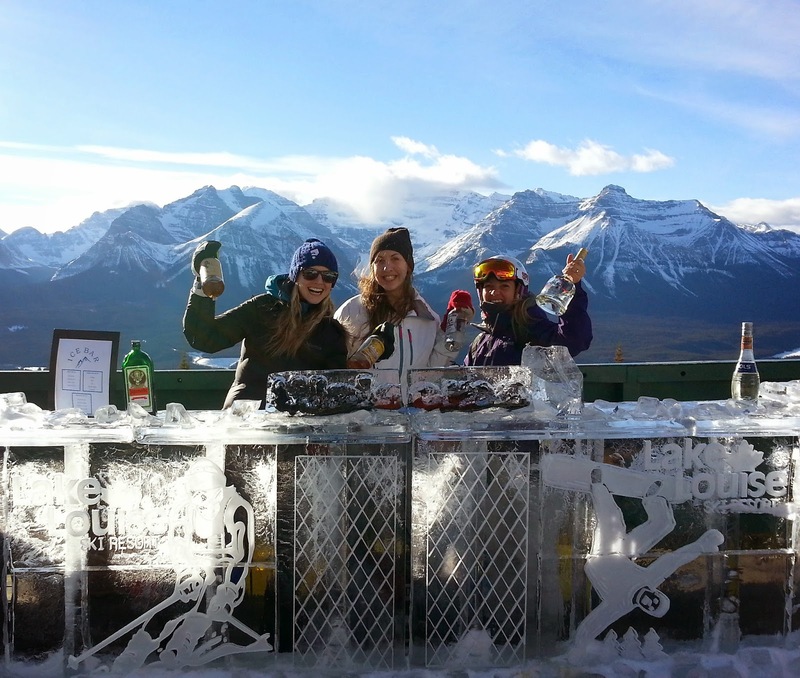 Virgin Radio is also taking over the apres-ski action at Kokanee Kabin Sat. And there will be music on the deck every weekend until season's close on May 3 as well as a long list of races, Easter activities and charitable fundraisers. Marmot Basin, Alberta has a full calendar of spring events including concerts, Hawaiian-themed races, and an Easter celebration. 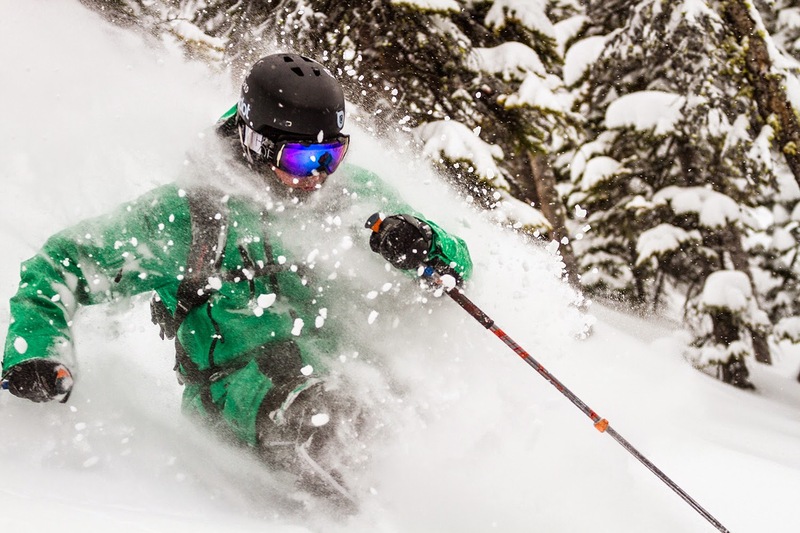 There's a great deal for all season pass holders from rival resorts anywhere in Canada or the USA: 40 % off lift tickets at Marmot from April 6 until the end of the season, May 4. 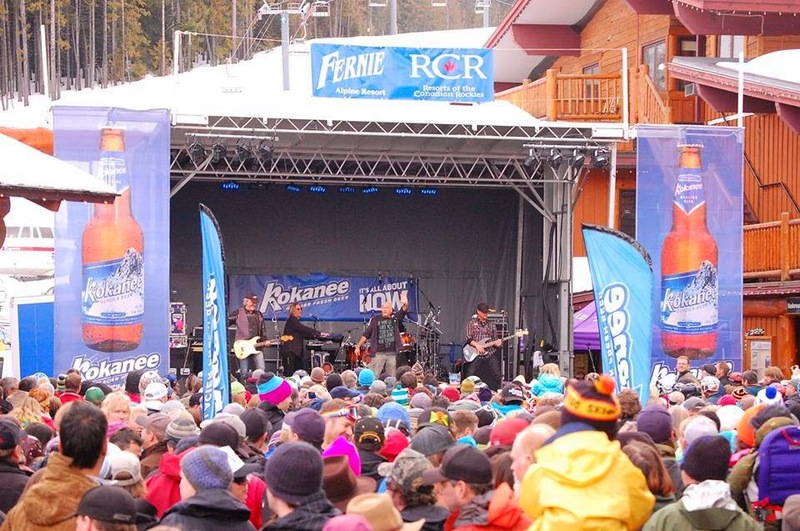 Fernie, BC, finishes off the season with the 6th annual Fernival concert April 12 and Slope Soaker contest April 13. Last weekend of the season at Kimberley, BC rounds off with a Spring Splash this Saturday and Dummy Downhill Sunday. Make sure to stop off for an Alpine dinner afterwards at The Old Bauernhaus just down the road from the slopes. 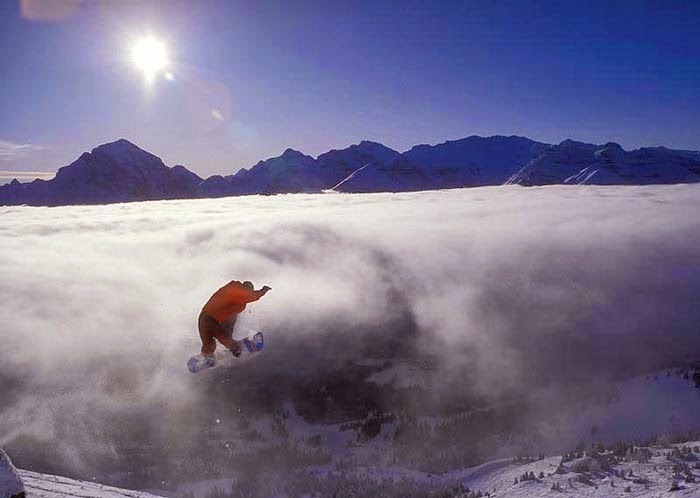 This weekend is the first of two Sun Splash Funk Fests at Kicking Horse, BC including concerts and an innovative team decathlon snow blades contest. There are still two more weeks skiing left at Panorama, BC which has extended the season due to late snowfalls until April 20, the longest season there in 14 year. 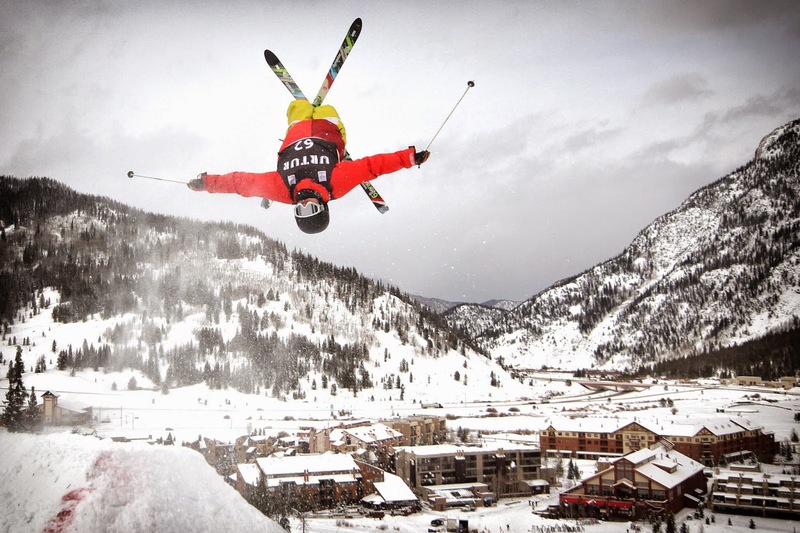 Spring celebrations there this weekend include a Superhero Sunfest featuring a peak to valley challenge, concerts and a two-day banked snowboard slalom event. Closing celebrations are Easter themed April 18-20. March was the snowiest month of the season at Whistler Blackcomb which chalked up 91cm more new snow last week. Spring skiing has been extended there until May 26. Known for its mega spring concerts and piste parties, Whistler is hosting the annual World Ski and Snowboard Festival Apr 11-20 featuring hip hop group De La Soul along with a full program of live music, skiing and arts. 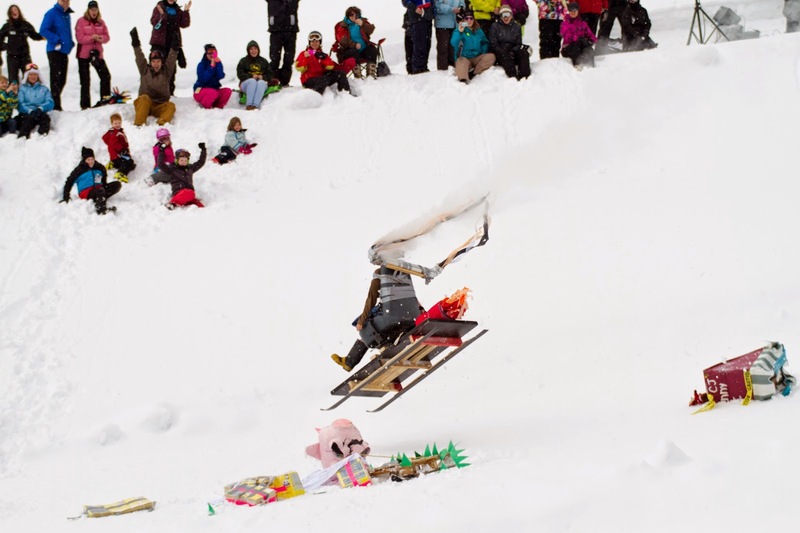 Skiers and riders at Big White, BC are gearing up for the Dummy Downhill next weekend. Their homemade contraptions will speed down the tube park with dramatic take offs and crash landings all contributing to the jollity. Whitewater, BC is running a Tribute Throwdown Slopestyle this weekend and then finishing the season off with a Beach Party Apr 6 featuring Fat Bike races, live music and a pet-friendly Dogstacle race. A first at Silver Star, BC this season is a couch race this Sunday with five-man teams negotiating the village course on couches mounted on skis. This is part of the annual Showdown Throwdown Hoedown event, now in its 9th year. 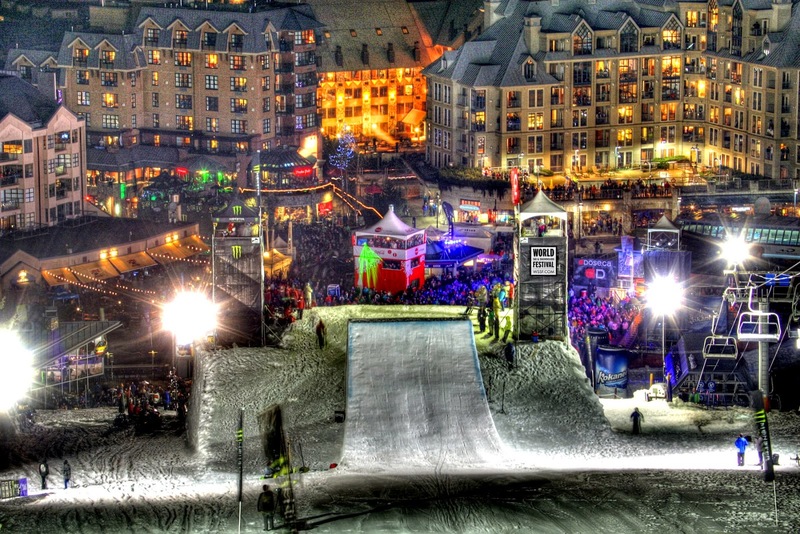 Mont Sainte Anne, Canada takes spring skiing to a new level with five weekends of festivities dubbed Spring Madness, encompassing activities such as yoga, spa, live music from rock and blues to contemporary, banked slalom contests, sugar shack, Easter egg hunts, blow-up castles, and barbecues. 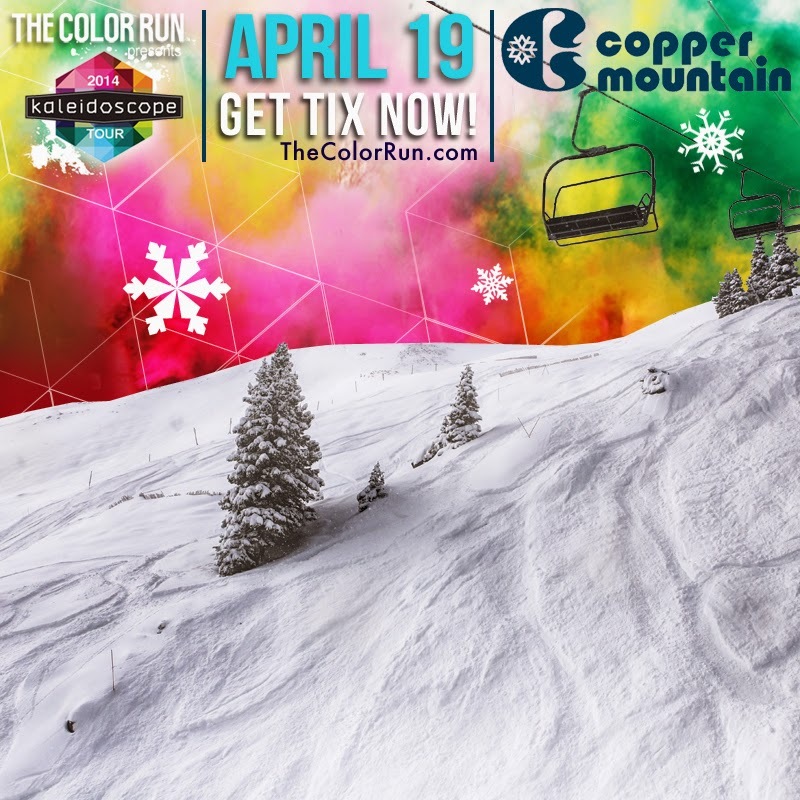 Copper Mountain, Colorado has reintroduced its Sunsation Spring Festival this April with two weekends (Apr 12-13 and 19-20) of wacky activities and live music, including a Slopesoakers event (rail jam meets pond skim) and the first ever on-snow Color Run - a 5k run on a manicured snow path. 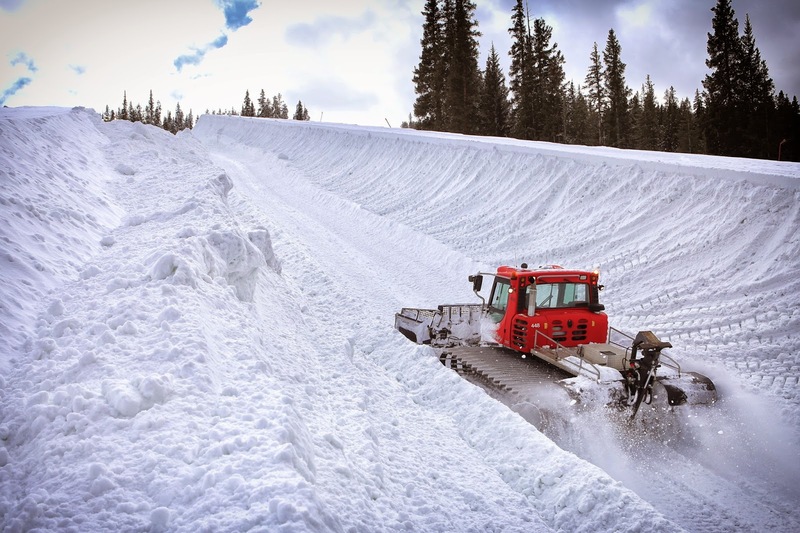 Spring Fever has already hit Breckenridge, Colorado which has also extended its season an extra week until April 27 due to an extra deep snowpack. The Spring Fever Festival runs until season's end with activities on the hill as well as in town as well as four dedicated concert days. Easter weekend features egg hunts and a sunrise service at Ten Mile Station. 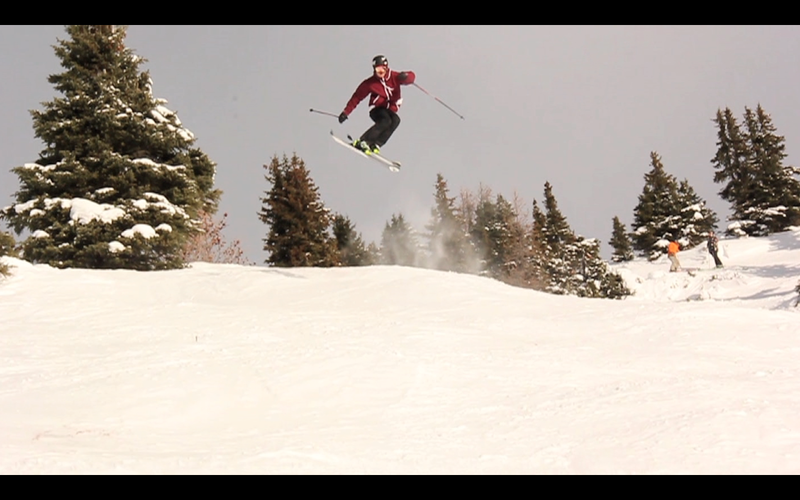 I'm going to be skiing both Breck and Copper from next weekend, so look out for my Colorado Capers coming up soon!